3D observation of thick tissue specimens usually requires a two-photon excitation microscope due to the increased absorption and scattering of light that occurs when imaging deeper into the tissue sample. While the liver is typically a highly-scattering tissue, the use of clearing methods combined with the appropriate optics can enable thick tissue 3D observation using the FV3000 confocal microscope. In this experiment, the Olympus 30x silicone oil immersion objective with a numerical aperture (NA) of 1.05 and a working distance (WD) of 0.8 mm enabled high resolution 3D observation of the biliary tree structure in cleared mouse liver samples. Courtesy of: K. Kamimoto, K. Kaneko, CY. Kok, H. Okada, A. Miyajima, and T. Itoh, "Heterogeneity and stochastic growth regulation of biliary epithelial cells dictate dynamic epithelial tissue remodeling," Elife, 2016 Jul. 19;5, pii: e15034, doi: 10.7554/eLife.15034. Experiment protocol for visualizing a complex biliary network in 3D. 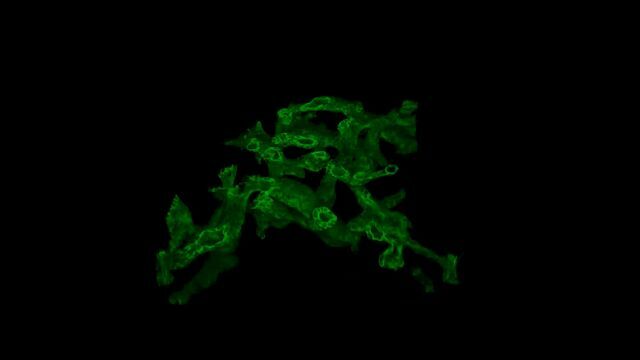 Following tissue collection, biliary tissues undergo immunostaining to visualize a complex biliary network in three dimensions. The immunostained specimens are then cleared using SeeDB1). The goal of the experiment was to quantitatively measure the length and thickness of the branches of biliary tree structures in injured mouse livers. For initial screening of samples, a 20x dry objective was used on the FV3000 to obtain consecutive, wide field-of-view tomographic images of biliary tissue (green, biliary epithelial cell marker CK19) in 200 µm thick cleared liver tissue specimens. This setup enabled effective quantitative observation for many samples, and enabled us to quickly find samples to examine at higher resolution. In the image above, the scale bar represents 100 µm. To obtain higher resolution three-dimensional images, the FV3000 microscope and an Olympus 30x silicone oil immersion objective were used to obtain consecutive tomographic images (Z axial interval of 1 µm) of biliary tissue (green, biliary epithelial cell marker CK19) in 200 µm thick liver tissue cleared using SeeDB. This combination enabled high-resolution observation of the biliary trees of control and Klf5-LKO mice while maintaining a wide field-of-view. In the Klf5-LKO mouse, researchers observed CK19+ cell clusters (white arrow) that were spatially separated from the biliary tree. In this experiment, we analyzed 3D structures of biliary trees related to liver remodeling following a diet-induced liver injury. The biliary structure in cleared liver tissues in Klf5-LKO mice and control mice were compared using an FV3000 microscope. The microscope’s highly sensitive detector enabled the acquisition of wide field-of-view images with high resolution and brightness as well as fast observations with fewer images and averaging, resulting in many images that could be used for quantitative analysis. Furthermore, the Olympus silicone oil immersion objective enabled imaging at depth with high resolution, enabling us to find CK19+ cell clusters that were spatially separated from the biliary tree. These results suggest that biliary structure in tissue remodeling under various conditions of liver injury may be regulated by some molecular mechanisms. Until now, medical and biochemical research on the liver has mostly relied on conventional 2D observation methods using tissue sections instead of whole intact organs. Using these methods, however, it is challenging to detect and understand the “true colors” of the liver under physiological conditions and various conditions of liver diseases. Our research group developed new visualization technology for staining and clearing liver tissues, with which the 3D observation of the biliary structure in intact mouse livers was successfully realized for the first time. This combination of clearing and staining technology enabled us to detect dynamic biliary structural changes (biliary remodeling) and conduct research on its regulatory mechanisms and physiological functions. In those experiments presented above, we successfully established an experimental system for effective visualization of a 3D biliary structure using the SeeDB clearing reagent and a confocal microscope. By using an FV3000 microscope, some of the molecular mechanisms for biliary remodeling were clarified. With the techniques presented here, a confocal microscope is useful for 3D analysis of dynamic changes of various tissues and cells in the liver, including the biliary structure. We expect that our new visualization technology can contribute to the development of diagnostics and therapies for liver diseases and regenerative medicine through a better understanding of the process of development and regeneration from the viewpoint of tissue remodeling and inter-cellular interactions. H. Okada, M. Yamada, K. Kamimoto, CY. Kok, K. Kaneko, M. Ema, A. Miyajima, and T. Itoh, "The transcription factor Klf5 is essential for intrahepatic biliary epithelial tissue remodeling after cholestatic liver injury," J Biol Chem., 2018 Apr. 27;293(17):6214-6229, doi: 10.1074/jbc. RA118.002372, Epub 2018 Mar. 9. K. Kamimoto, K. Kaneko, CY. Kok, H. Okada, A. Miyajima, and T. Itoh, "Heterogeneity and stochastic growth regulation of biliary epithelial cells dictate dynamic epithelial tissue remodeling," Elife, 2016 Jul. 19;5, pii: e15034, doi: 10.7554/eLife.15034. K. Kaneko, K. Kamimoto, A. Miyajima, and T. Itoh, "Adaptive remodeling of the biliary architecture underlies liver homeostasis," Hepatology, 2015 Jun. ;61(6):2056-66, doi: 10.1002/hep.27685, Epub 2015 Apr. 22. The FV3000 series employs Olympus' TruSpectral detection technology that diffracts light via transmission through a volume phase hologram unit. This technology enables much higher light throughput when compared to conventional spectral detection units with reflection-type gratings, and minimizes the laser power needed for deep tissue observation. The refractive index of silicone oil (ne≈1.40) is close to that of living tissue (ne≈1.38), enabling high-resolution observations deep inside living tissue with minimal spherical aberration caused by refractive index mismatch. Silicone oil also does not dry out or harden, so there is no need to refill the oil, making it ideal for extended time-lapse observations. Unschlagbare Lösung in Bezug auf Qualität und Leistung für jede Art der digitalen Bildgebung - inklusive hochauflösender Mikroskopie tief in lebende Gewebe mithilfe von Silikonimmersions-Objektiven.